With their 2005 Roadrunner debut, Ascendancy, Florida’s Trivium offered up a near perfect metal storm. Equal parts thrash, death and power metal, the album was a glorious blend of melody, brutality and instrumental prowess made all the m ore impressive by the fact that frontman/guitarist Matthew Heafy was still a teenager, and the rest of the band weren’t that much older. Trivium won a pile of awards from the drooling metal press and sold a pretty respectable number of albums for someone who essentially came out of nowhere. Now comes the hard part, following it up. And the results on The Crusade, though it remains a veritable metal feast, are somewhat mixed. Trivium score big for wisely avoiding the temptation to merely rehash what worked so well on Ascendancy, giving The Crusade, for the most part, a surprisingly distinctive sound when the two are compared side by side. That said, however, the band could easily be accused of idol worship with The Crusade. Its old-school thrash approach echoes Ride The Lightning-era Metallica with its gnashing riffs, complexity and vocal technique — you’ll swear that’s James Hetfield barking “yea-ah, yea-ah” on “Anthem (We Are The Fire)” — and Rust In Peace-era Megadeth with its skull-scrambling solo trade-offs by Heafy and Corey Beaulieu and unapologetically pompous air a bit too closely for comfort. The presence of Iron Maiden also hangs rather heavily over The Crusade — especially on the epic instrumental title track that closes the album in a hail of dogfighting leads, nimble bass runs and spray-gun drumming. Trivium seem content to keep things in speed metal cruise control here, and most of death metal flourishes that gave Ascendancy its menace have largely been shed — not that that’s necessarily a bad thing. The Cookie Monster/clean vocal gymnastics have been done to death by now, and the band boasts plenty of muscle and assertiveness as it is. Having played 300-plus shows in support of Ascendancy, Trivium learned that big, moshable power chords and chest-beating, singalong choruses — as evidenced by “Ignition” and “Entrance of the Conflagration” — can be just as effective at bringing the hammer down than blast beats and death grunts and definitely use that to there advantage. The Crusade has an anthemic quality that used to come so easily to bands like Exodus, Testament or even, dare I say, Anthrax but is so sorely lacking in all but the cheesiest of metal these days — your Manowars and Dragonforces, etc. Despite its soundalikedness, the album’s larger than life feel — and the band’s obvious skills and confidence — is hard to dismiss and nearly impossible not to admire. 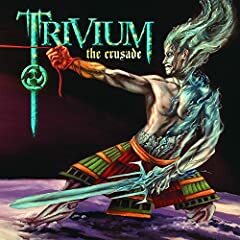 So The Crusade is something of a step sideways for Trivium, who were probably just as surprised by how high Ascendancy set the bar for them as everyone else. And at the end of the day, there’s really no shame in that.